“Bicycle Thieves” is the most universally praised movie produced anywhere on planet Earth. It is a timeless film that belies its age and has acted as an inspiration for several great film directors such as Satyajit Ray. It is powerfully poignant and tragic, portraying the hopelessness and powerlessness of the underclass of all nations. This film as perfect as a crystal formed in weightless space. 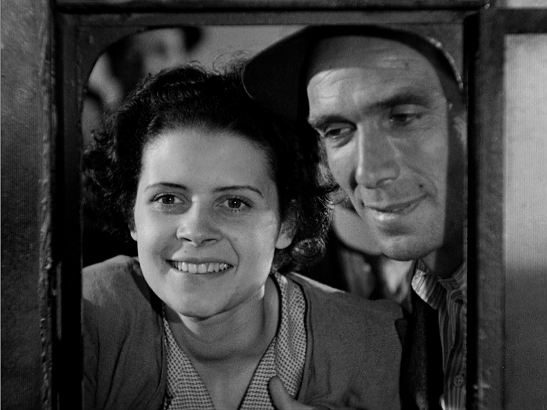 It's the purest distillation of Italian neorealism, defined as "a style of film set amongst the poor and working class, filmed on location using nonprofessional actors, depicting the difficult economic and moral conditions of post-World War II Italy, reflecting the conditions of everyday life: poverty and desperation." 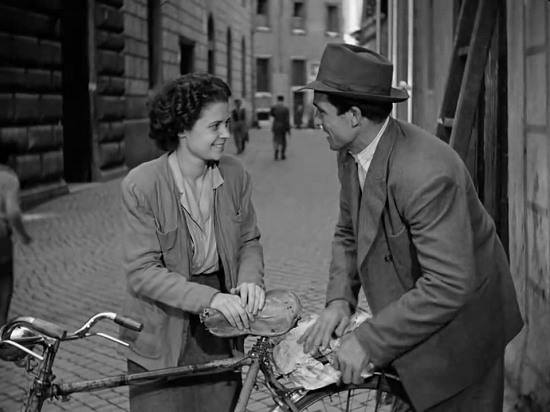 There isn't a scene or a sound extraneous in “Bicycle Thieves”. It's potently emotional without being in any way sentimental. The realism is absolute; one can say, yes, that was Life in that place and that time. But it's more than a documentation of poverty in post-war Roma; it's a universal story of the balance of needs between a father and a son. It doesn't preach any social agenda or ideology. It just reveals. 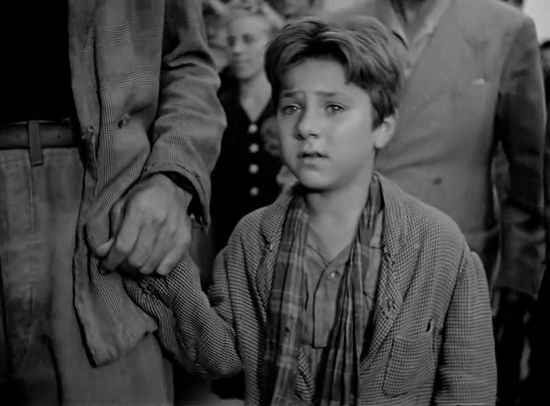 Vittorio De Sica's remarkable 1947 drama of desperation and survival in Italy's devastating post-war depression earned a special Oscar for its affecting power. Shot in the streets and alleys of Rome, De Sica uses the real-life environment of contemporary life to frame his moving drama of a desperate father whose new job delivering cinema posters is threatened when a street thief steals his bicycle. The story is simple. Antonio (Lamberto Maggiorani) is a poor man who is thrilled when he is at last offered a job: delivering and putting up movie posters. But he needs a bicycle, and must supply his own, so his wife Maria (Lianella Carelli) pawns the family's entire stock of bed linen to redeem the bicycle he had already hocked. On his first day at work, the unlocked bicycle is stolen and Antonio drops everything to go on a desperate odyssey through the streets of Rome with his little boy Bruno (Enzo Staiola) to get his bike back, pleading and accusing and uncovering scenes of poverty similar to theirs wherever they go. They create uproar in classic crowd moments: in the streets, in a market, in a church mass. Faces always gather avidly around the pair, all commenting, complaining and generally magnifying the father and son's distress and mortification. This is a story that magnificently withholds the comic or dramatic palliatives. Antonio and Bruno are a world away from Chaplin and his Kid. The son is the intimate witness of the father's humiliation, his inadequacy as a provider. The scenes at the beginning of the film, when Antonio casually leaves his bicycle unlocked but it remains for the moment miraculously un-stolen, have to be watched through your fingers. The relationship between the father and the son demonstrates the mindset of that period. Antonio seems unable or unwilling to embrace the obvious redemptive moral - that his son is the important possession, not the wretched bicycle - and De Sica is unwilling to embrace it either, perhaps precisely because it is too obvious, or because this moral is a luxury that only well-off people can afford. The father is obsessed with finding a stolen needle in the urban haystack, obsessed with getting his job back. Again and again, he ignores his little boy while scanning the horizon for his bicycle. At one stage, he hears uproar from the riverbank about a "drowned boy". With a guilty start, he looks around. Do they mean Bruno? No: there he is, safe and sound. But the lesson is not learned. He doesn't even hold Bruno's hand! And, in a later scene, we see the poor boy almost run over by a car because his father isn't looking out for him. Bruno's simple physical survival is the movie's secret miracle, and he is finally to be his father's savior, but in such a way as to render Antonio's humiliation complete. This is poverty's authentic sting: banal and horrible loss of dignity. 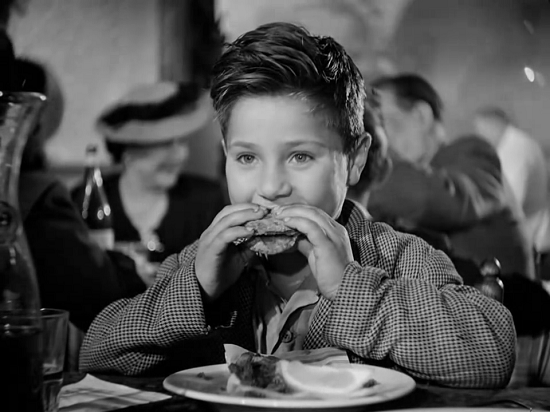 Seen from the perspective of today, it is the sparseness and restraint of the film in general and the performances in particular that make "The Bicycle Thieves" such a powerful experience. That, and something more. For this film manages to appeal to the better angels of our nature in a way that only deepens as we grow older along with the film. The passage of time has only intensified the resonance of something De Sica said 60 years ago: "We are so tired, we have lost any feeling of responsibility toward anyone but ourselves and, when we cut ourselves off from our brother, we prepare our own destruction." 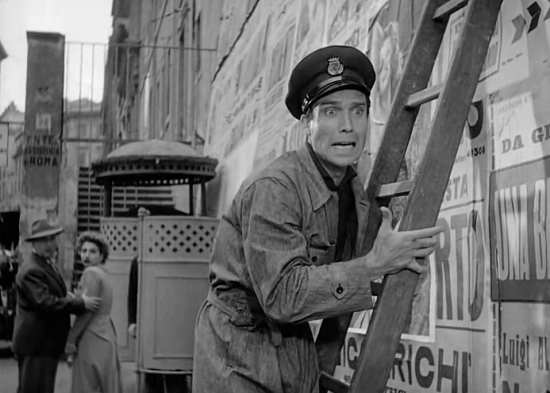 See "The Bicycle Thief" and delay the apocalypse, if only for an 93-minute span. 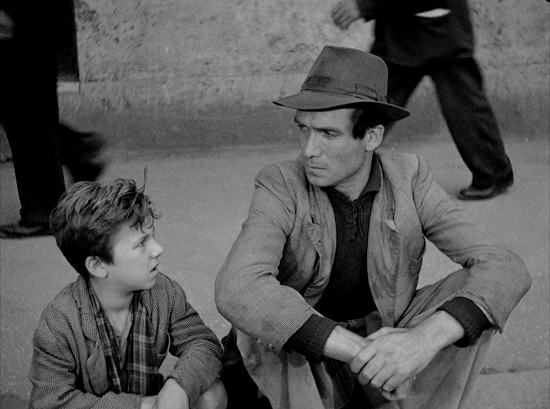 “Bicycle Thieves” is an uncompromising, brilliant work of art.